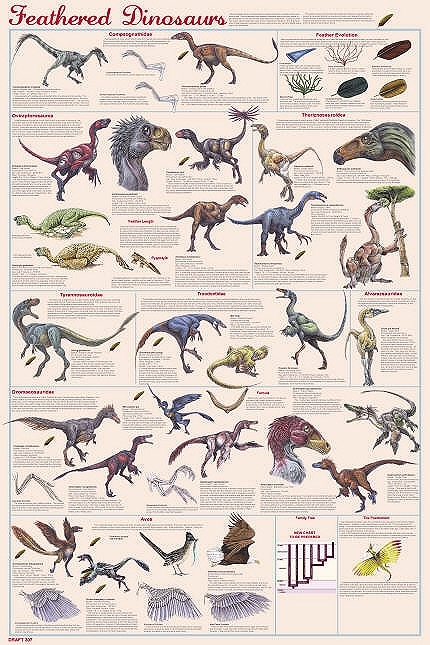 Species - Most dinosaur books show only a single species from each group. 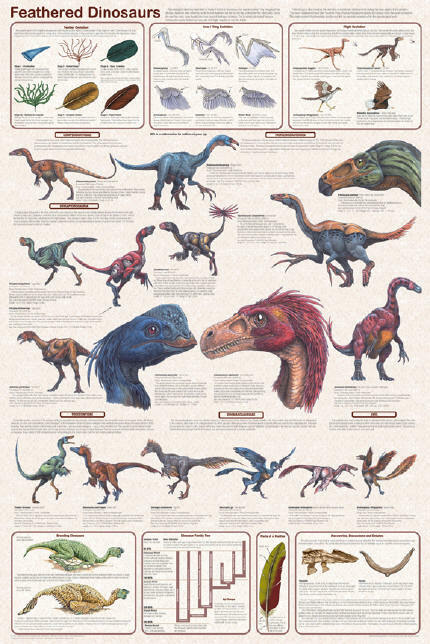 The poster first introduces each group then shows several species that demonstrate how the group evolved over millions of years. The caption for each species cites what the name means, how it is pronounced, the size of the species, when it lived, where it lived and a short summary of why it is unique. This format is used on the menu at left, but it also tells how many million of years ago a species lived to permit determining which ones were more or less contemporary. Information - The poster presents interesting facts about feathered dinosaur in insets. That material is listed under the Information Section. Feathered Dinosaurs strives to provide a comprehensive overview of the subject and it has been called a highly condensed book on the subject. Space limitation do not permit showing everything we know, but space is not an issue on this web. Accordingly, we are able to show more species and provide more information. Notes: This poster was first published in October of 2004. Since then major new discoveries have been made and they are incorporated into this section, even though they are not on the poster. The poster is now being revised to include those new species updated data and other information. Current status of 2007 version shows 25 species. Graphic design has not been finalized. A textured background will be substituted for the tint block.